Here's more about Expected Goals (xG) and Expected Assists (xA). Expected Buildup Goal Chain is abbreviated to xB. Defensive Acts are per 96 minutes and are defined as blocks, interceptions, tackles, and challenges. Touch percentage is the player's percentage of all team touches while on the field. Pretty much all the data in the above graphic can be found in our interactive tables. They're pretty cool so you should check them out. The 2017 campaign was a disaster for D.C. United. But a top-to-bottom roster rebuild and a brand new stadium should give United fans reason to be optimistic about the 2018 season. D.C. United came into the 2017 season riding the high of a late-season surge from 2016, but 2017 turned out to be a disaster. United finished dead last in the Eastern Conference with just 32 points, and second-to-last overall. A few key players succumbed to father time, several others could not stay healthy, and inadequate depth behind them made it a hard season for United fans to stomach. Offensively, United was just not the same attractive, “total football” team that lit the league on fire in late 2016. They generated only 41.78 xG across 34 games (4th worst in the league). To make matters worse, United was only able to secure 27 of those, making it the lowest-scoring team in MLS (with due respect to former team goalscoring leader "own goals", we exclude them from our counts). As much as the lack of goals was frequently pointed to as the main problem last season, United was also a mess defensively. They allowed 57 goals (2nd worst in the league) compared to 55.59 xGA (also 2nd worst in the league), which meant that the Black and Red finished with a -30 goal differential overall, the worst in the league. Ouch. The D.C. United roster needed to get younger, better, and deeper at all positions. Notable departures from last season include Bill Hamid, Marcelo Sarvas, Bobby Boswell, Lloyd Sam, Rob Vincent, Sean Franklin, Patrick Nyarko, Chris Korb, and Deshorn Brown. At goalkeeper, General Manager Dave Kasper acquired both David Ousted (formerly of the Vancouver Whitecaps) and Steve Clark (formerly of the Columbus Crew) to fight it out for the starting job between the posts. The United back line was bolstered with a trade for former NYCFC center back Frederic Brillant, and former Seattle Sounders fullback Oneil Fisher. United also invited Chris Odoi-Atsem to camp as a trialist, and there is a rumor that D.C. United may be pursuing a Costa Rican fullback as well. In midfield, the Black and Red brought in Venezuelan international Junior Moreno, Costa Rican Ulises Segura, and former Atlanta United winger Yamil Asad on loan from Velez Sarsfeld with an option to buy. These three raise the level of play and provide depth to the existing midfielders of Paul Arriola, Luciano Acosta, Zoltan Stieber, Russell Canouse, Bruno Miranda, and Jared Jeffrey. Up top, United parted ways with Brown, but brought in fellow Jamaican striker Darren Mattocks in a trade with the Timbers. Given Patrick Mullins' knee injury and drop-off in production in 2017, it’s not terribly surprising to hear statements from the team that Mattocks and Mullins are in open competition for the starting job. Bruno Miranda, a 20 year-old winger/forward from Bolivia, can also be rotated in at forward if circumstances require it. Forward may appear to be the thinnest position on the depth chart, but Head Coach Ben Olsen is expected to deploy a formation that only utilizes one up top. United are in the process of building a shiny new stadium in the District of Columbia—Audi Field—which is long overdue for an MLS original that has been losing gobs of money playing at RFK stadium. The problem is that Audi Field construction won’t be finished until the summer, with the premier opener scheduled for July 14th against the Vancouver Whitecaps. This means that in the first half of the season, the Black and Red will play 13 away games and just four home games—two of which will be played at alternate venues in the D.C. area. The most grueling stretch of travel is a seven away-game stretch that runs from late April through early July against Philadelphia, Real Salt Lake, San Jose, LAFC, Seattle, New England, and the LA Galaxy. Historically, MLS teams average around one point per game when on the road, so it won’t be much of a surprise if United are near the bottom of the table come July. On the other hand, DC. United will get to play 13 of their final 17 games at Audi Field, which includes a seven game home stretch before closing out the regular season at Chicago. In the past, teams with similarly unbalanced schedules were able to string together some impressive home stands in the latter half of the season. Last year Atlanta United played eight of their final 10 games at their new home (Mercedes-Benz Stadium) with an impressive 5-1-4 record that propelled them into the playoffs. In 2011, Sporting Kansas City had to play their first 10 games on the road while construction wrapped up at Children’s Mercy Park. Sporting KC generated just one win in that 10 game stretch. But once they settled into their new home, they finished the year with a 12-3-9 record and finished first in the Eastern Conference. The 2018 campaign may very well be tale of two halves for D.C. United. So if they sit at the bottom of the table in July, don’t count them out just yet. D.C. began the 2017 season in a 4-1-4-1, but Olsen had to shift to a slightly more defensive 4-2-3-1 once it became obvious that they lacked a lock-down defensive midfielder to shield the back line. My gut tells me Olsen starts 2018 in the 4-2-3-1 given the roster turnover and grueling road schedule for the first half of the season, but will eventually move back to the 4-1-4-1. In goal, United has both Clark and Ousted competing for the starting job. Ousted is currently the favorite to begin the season, and has put up strong numbers in past seasons when he was the starter for the Whitecaps. Ousted’s strongest season came in 2015, when he allowed 36 goals compared to 42.04 xGA across 3246 minutes. Steve Clark’s most successful campaign was with the Columbus Crew, also in 2015, when they made it to MLS Cup but lost to Portland. That year his GA-xGA was 3.61. United brought in French NYCFC veteran Brillant to organize and lead the back line—a role that was vacated once the team traded veteran Boswell to Atlanta United. The hope is that Steve Birnbaum will rebound from a season plagued by injuries and concussions and solidify his starting job, but Kofi Opare proved capable last season when Birnbaum was out. Jalen Robinson and U.S. U-20 standout Chris Durkin provide additional center back depth if needed. The team is a bit thin at fullback right now, with only Nick Deleon (a converted midfielder), Taylor Kemp (coming off of hip surgery), and recent acquisition Oneil Fisher on the roster. Chris Odoi-Atsem is back in camp and looks likely to earn a new contract, and Kasper recently said the team had interest in a Latin American fullback. Overall, fullback is a position that is still a work in progress. Playing a five-man midfield formation meant Kasper had to gather a lot of new pieces once he realized how shallow and old the 2017 midfield was. At the end of 2017, the team brought in Hungarian winger Stieber, USMNT winger Arriola, and former USMNT U-20 standout Canouse at defensive midfield. Additional competition was added this off-season in central midfielder Moreno and central midfielder/winger Segura. The biggest move this off-season was acquiring Asad on loan with an option to buy. A variety of factors led to Atlanta declining his purchase option after the 2017 season, yet United was wise to go after him. A big reason D.C. struggled so score most of last year was a lack of chance creation. Nyarko and Sam were sufficient when healthy, but spent most of last year injured. This meant Acosta had to carry the load by himself at several points in the season, which made it easier for teams to shut down the attack. Asad bagged seven goals and 13 assists playing for Atlanta, and generated 53 key passes across 2800 minutes. As far as wingers go, this is DP-level production, and it should really help open up the D.C. attack. One slight cause for skepticism is that Asad (like Atlanta as a team) significantly over-performed both his expected goals (4.5 xG) and expected assists (5.6 xA) in 2017. We'll find out this year if that was because of skill or luck. At forward, the two main options are Mullins and Mattocks. Mullins has a more back-to-goal style of play, flicking passes to teammates running into space, or tapping-in service from the flanks. United fans were incredibly frustrated by Mullins’ lack of production in 2017 (just five goals) given that he closed out the 2016 season with eight goals and two assists in just 14 appearances. But although Mullins finished 2017 with only five goals, his xG figure was 5.99 over 1100 minutes, or 0.51 expected goals per 96 minutes (xGp96). An xGp96 of 0.51 would put him among some very notable attacking players, such as Jozy Altidore (0.50 xGp96), Joao Plata (0.50 xGp96), Mauro Manotas (0.51 xGp96), or Sebastian Giovinco (0.51 xGp96). However, I would argue that Mullins’ xGp96 of 0.50 is probably skewed by the San Jose game where he scored 4 of his 5 goals on almost 2 xG in a one-sided rout (a topic to be explored more in a future ASA article). This would suggest that his service for the other ~1000 minutes of the season was lacking. Having a healthy midfield of Acosta, Asad, Stieber, or Arriola should boost that xG number in the 2018 season. In contrast to Mullins’ style of play, Mattocks either looks to run the channels when his team is in possession or beat them on the counter with his incredible speed. While Mattocks has never scored more than seven goals in a season over his professional career, Kasper expressed confidence in Mattocks as a goal-scorer whenever he makes the game day roster. Mattocks, due to his ability to put himself in dangerous positions on counter-attacks, is also good at drawing fouls in and around the penalty area, which could mean a bump in PK opportunities or set-piece chances in 2018. It would be difficult—statistically speaking—for D.C. United to be worse in 2018 than they were in 2017. Still, the roster rebuild should give United fans hope for an improved year. Looking at the roster as it stands, and the weird schedule due to ongoing stadium construction, it is reasonable to say that this team should be able to compete for a playoff spot. 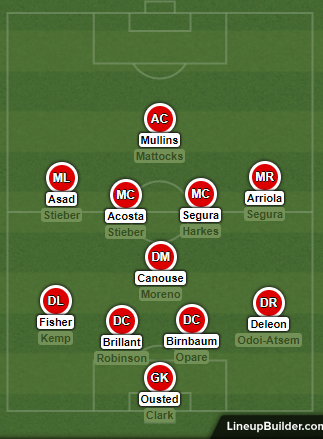 But despite the fact that this roster is now younger and deeper at all positions, D.C. United still lack true “difference makers” that will elevate this team from a borderline playoff team to a team that can truly compete for silverware. But honestly, this requires a *large* financial investment from ownership, and right now they are still putting the finishing touches on Audi Field and breaking ground on a new training complex in Loudoun County. This is not to say it won’t happen, but it looks like this club will remain a middle tier competitor in 2018.